To maximize the overall value of learning and development spending, and to ensure flexibility and capacity for the economic recovery, learning and development organizations must constantly evaluate and reallocate their staff. While the relevance of learning and development has increased steadily since 2006, many enterprises still struggle to find a way to have more impact on organizational objectives. Every other month, IDC surveys Chief Learning Officer magazine’s Business Intelligence Board (BIB) on a variety of topics to gauge the issues, opportunities and attitudes that are important to senior learning executives. For the last several years, members of the BIB have been asked to provide annual insight into their outlook for the year ahead. 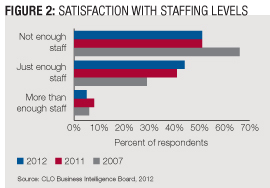 This month, IDC compares how CLOs feel about staffing in 2013 to their outlook in recent years. Learning and development investments increased in 2012 and are expected to increase again this year. While many firms reduced learning budgets between 2008 and 2010 in reaction to the global financial crisis, learning technologies continue to be a priority. Almost 55 percent of CLOs expect their budgets to increase in 2013 and approximately 10 percent expect a decrease. At the same time, more than two out of three CLOs expect their organizations to develop more custom content, and the same percentage expect their companies will develop new techniques to deliver learning. Therefore, learning organizations continue to expand their roles and are also refocusing attention on learning delivery and content development. CLOs expect to continue their investment in learning management systems and learning content management systems. While economic conditions are slowly returning to pre-crisis levels and will continue to impact learning budgets, optimism is winning out, and funding appears set to return to 2013 budgets. Competencies, informal learning and instructor-led training (ILT) will remain priorities in learning and development. And, while ILT remains important, the impact of less structured experiences such as informal learning, self-paced learning and mentoring demonstrate an explicit understanding of the role non-classroom experiences have in employee development. In spite of the importance organizations place on learning technology or purchased content, the largest common expense for most learning and development organizations remains spending on staff. Analyzing how learning and development organizations allocate staff in addition to how much staff they deploy is the beginning of a process to better apply existing resources. While the global and local economic outlooks remain murky, enterprises continue to invest to improve key functional areas such as supply chain, the finance function or other priorities. In some cases, this is simply to maintain share against competitive pressures; in others, it’s an attempt to take advantage of a crisis and take share from struggling competitors. Regardless of the reason for the investment, enterprises must not forget to also focus on employee performance. Learning and development has never been more important to organizational success than now as companies transition from crisis to regrowth. Learning executives are more optimistic about the outlook for employee development, with 56 percent of CLOs more optimistic about 2013. Only 16 percent feel less optimistic, a slight reduction from last year. The reasons for this optimism are economic recovery and an increased climate of stability after the U.S. elections. CLOs increasingly believe employee development will be integral to business growth in the next two to five years, but learning and development will need to continue to adapt to business needs. In the learning outlook research published in January in Chief Learning Officer magazine, it was reported that more CLOs believe “economic conditions seem to have hit a floor … and in some areas are beginning to improve.” This will lead to increased importance of succession planning and will prompt investment in learning strategies. Some CLOs see opportunities beyond development but see an increased focus on talent management as a whole. This suggests a shift in staffing priorities. Last year, Chief Learning Officer reported that 80 percent of organizations felt learning and development could play a moderate or significant role in helping their organizations achieve strategic goals, and enterprise learning and development initiatives are increasingly focused on core business priorities. Like the wider enterprise, learning organizations that focus on outcomes drive business value. As seen in research for the past several years, learning organizations have tightened their belts, but have also increased their efforts to ensure the entire workforce is prepared to execute on the strategic imperatives. However, only 45 percent of learning organizations feel they play a significant role in helping their enterprise execute its strategic objectives. Going forward, an imperative for learning leaders must be to ensure they play a significant role in doing so. Otherwise, the CLO will preside over an organization ripe for trimming. The learning and development organization has changed since 2006. As a result of increased focus on learning strategy, organizational development and performance, learning leaders have become an increasingly meaningful component of many organizations. During the last six years, there has been a significant reduction in the size of content development and instructional design staff. Tools have helped improve these teams’ efficiency. Other trends — such as shorter courses and more rapid course development approaches — have reduced the need for content developers by half since 2006. The trend toward online learning hasn’t had the impact some observers would have expected, however. CLOs report that the percentage of their staffs who are instructors has increased slightly during the past few years (Figure 1). On the other hand, while technology is playing an increasing role in learning — both for instructor-led learning, self-paced instruction, content development and facilitation of social learning experiences — the percentage of technology specialists has declined since 2006. Better, easier-to-use products, more sophisticated management tools and greater administrator skills are the primary reasons for the trend. Between November 2008 and mid-2010, learning organizations lost about 10 percent of their staff. Since 2011, staffing has remained generally steady. Regardless of the economic challenges or the learning organization’s ability to help achieve the change initiative, learning and development organizations have experienced their fair share of belt-tightening. Learning leaders are often asked about the appropriate size of a learning and development staff to serve the broader enterprise. That ratio is highly variable. Before 2008, the ratio of learning staff to overall staff in large organizations could be close to 0.5 percent with a small number of learning professionals serving a very large employee base. In smaller organizations that ratio could have been as high as 3 percent. In late 2012, those ratios were somewhat lower. As enterprises recover staff and expect longer-term growth, IDC does not expect that ratio to grow much as learning becomes a slightly smaller proportion of the overall workforce in 2013. This is because any operational shift or improvement the learning organization instituted during the crisis — in development efficiency, organization consulting staffing or technology management — is not likely to be undone. 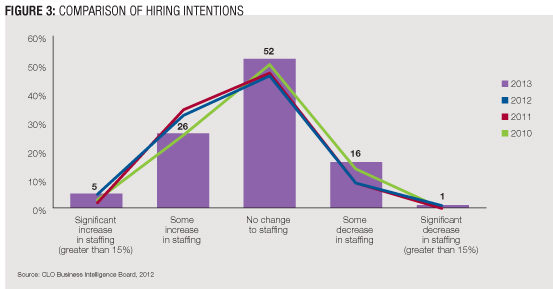 In 2012, more firms reported they had an appropriate level of staffing, but others felt understaffed (Figure 2). Some 51 percent of CLOs felt they didn’t have enough staff. While this is the lowest rate of dissatisfaction that has been recorded and is down from a high of 66 percent in 2007, it still reflects a constrained organizational structure. Only rarely — less than 10 percent of the time — do CLOs report they have more staff than they need. About 30 percent of CLOs expect some increase in learning staffing in 2013 — down slightly from 2012 and 2011 — and slightly more expect a decrease (Figure 3). While CLOs are increasingly optimistic and many believe their enterprises are increasingly important to organizational success, economic constraints prevent this from translating into significant staff increases. About 65 percent of organizations hired learning and development staff last year, and 48 percent expect to hire it in the coming 12 months either as replacements or to increase the learning organization’s size. When companies do hire, 75 percent of CLOs report it was easier or about the same difficulty to hire appropriate staff compared with 12 months ago. Learning professionals appear available to fill vacant positions. More organizations believe the job market will get tighter going forward, but essentially, the learning labor force appears to be at a point of equilibrium (Figure 4). Even though the mix of learning and development skills has shifted away from content developers and instructional designers, those skills remain the most likely to be hired and the most difficult roles to fill. In conclusion, research shows that more organizations expect to hire, fewer expect to cut back on learning staff, and the availability of talented learning professionals appears to be increasing. While many feel that learning and development could impact company strategy, many organizations feel their learning organization will play a role in the strategy their companies adopt. However, more than half of enterprises must find a way to have more impact on the achievement of organizational objectives. This may require better application of existing resources, or changing the role learning plays to become a more significant adviser and change consultant. CLOs must critically evaluate their ability to help their enterprise rebound during the recovery, and ensure their learning staff is ready and able to lend assistance. Cushing Anderson is program director for learning services at IDC. He can be reached at editor@CLOmedia.com.